Corporate social responsibility (CSR) in the last few years has moved with great speed from the margins to the mainstream of business. India is full of examples of responsible and responsive business houses partaking in social, economic and environment development of the country. With the changing paradigm of CSR in India, it is important to assist companies and other stakeholders get an understanding on the trends and current practices of CSR in India. 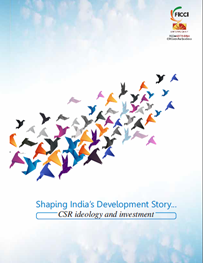 To share this, FICCI Aditya Birla CSR Centre for Excellence and 4th wheel has co-authored the book…”Shaping India’s Development Story … CSR ideology and investment”. In the book, 70 company applications received in the last three years (2010-12) for the prestigious FICCI CSR awards have been analyzed, to put forward representative data on the trends of CSR execution in India. The publication focuses on popular theories on business responsibilities, ethics and social investments, highlights current trends on CSR execution and ideology and concludes with outlining mechanisms to make the most of the CSR investments.